This year’s nominations for the Retail Week Interiors Awards have just been announced! We’re pleased that two I-AM projects have been recognised as outstanding in the category of Best Leisure Food & Drink Shop. Our work with Pizza Union on their second site in Kings Cross received a nomination. The restaurant combines a dramatic and atmospheric interior with a cool and urban personality and has proved hugely popular with customers and awards judges alike. The second nomination was for our work with KFC. 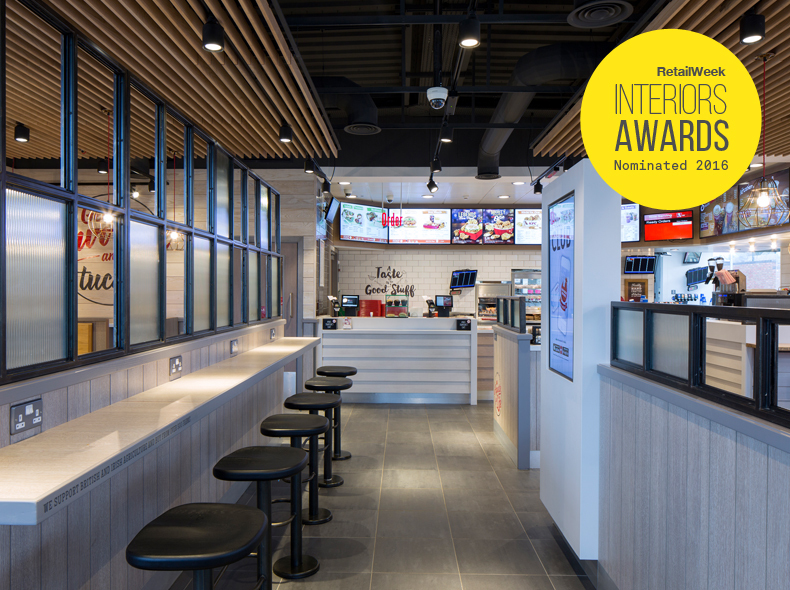 The team at I-AM has worked with KFC for over two years and in that time we have helped upgrade their in-store experience, with the results applauded by the Awards. The work includes innovations in service design and a refreshed suite of communications. Elements of the flagship restaurant in Carmarthenshire look set to be rolled out nationally over the coming years. In addition, we offer our congratulations to everyone else nominated as the calibre of projects in the Awards is incredibly high. We’re always on the lookout for inspiring retailers and restaurants to visit during client store tours so we look forward to seeing much of the shortlist soon. The Awards ceremony will be held in London in November and a full list of nominations can be browsed on the RWI Awards website.